Next month it will be time for the WI Annual Meeting. I wanted to take this opportunity to thanks those treasurers who are standing down, for the time and effort you have put into this very important job. I am sure your members, as do we at the Federation, appreciate all that you have done for them. Hopefully, you will have someone who is prepared to take on the role from you. I know that many people worry about the role of Treasurer but if anyone is considering it then do be aware that there is a lot of support available to new treasurers. Also remember that it is a role that can be shared between two people. As I mentioned in the previous paragraph there is support available. The Federation runs two one-day courses for new treasurers, this year the dates will be the 10th and 16th July. The courses will be advertised in the West Kent News so do keep your eye open for the application forms. As well as this there is a Treasurer's Training Module on My WI and of course if you have any queries please do get in touch and I will do my best to assist you. The following is something I have put together to highlight the main responsibilities of the treasurer's job. It is available to download here and hard copies will be available from myself. I hope it will be a useful resource for WIs to show potential treasurers. I also hope it won't scare them off! Collect the annual subscriptions and other monies and pay these into the bank (this should be done promptly), Issue receipts for all money received. Make sure that obligatory payments are made e.g. membership fees to the Federation, pooling of fares. Maintain a day book of receipts and payments. Maintain petty cash system if your WI operates one. Reconcile the bank statement monthly. Prepare the end of year financial statement and arrange for it to be signed off by an Independent Financial Examiner. Once again, I thank you for the work you do and I hope that new treasurers will find the job as rewarding as I did when I was my WI's Treasurer. I have had a number of Treasurers contact me recently concerned about changes that the Charity Commission have made to the information now require when a WI does its annual return and has to update it’s details. For instance the Charity Commission now require email addresses of all trustees and bank account details. Obviously this has been of concern to Treasurers, with some worrying that details, could be vulnerable to hacking etc and that it was becoming more of a burden to complete the return. I contacted the NFWI Head of Finance to ask whether he was aware of these new requirements and I copy his reply below. You will need to provide details of all your charity’s UK bank/building society accounts. This information will not be available to the public. We will use the information to make sure that charities are protecting and managing their funds appropriately, where we need to. Trustees have a duty to act responsibly, reasonably and honestly and protect charity funds and assets so that they are only used to support or carry out its purposes. Working inside the regulated banking system is the best way to achieve this. Holding a bank account also aids with transparency providing an audit trail and records, such as bank statements’. Finally It might be worth remembering that if your income is less than £5,000 you can deregister your WI, even though NFWI feel its good practice to remain registered. However, I do know that a couple of WIs have recently deregisterted because of concerns around the extra information now being asked for. The poem says March brings breezes to stir the dancing daffodil. However, for WI Treasurers it also brings the end of the financial year and time to prepare the end of year accounts. Therefore, I thought it would be useful to repeat a Treasurer's Corner from a couple of years ago and offer some suggestions to hopefully smooth the process and try to ensure there are no last minute panics. If you have not already done so, reconcile the bank account, leaving only the last few items to be agreed at the year-end. Make sure you have to hand the necessary paperwork relating to all payments you have made, together with supporting documentation. Make sure all the receipts you have issued includes information indicating what the money was received for. Ask your committee to submit any outstanding expense claims in good time. If your WI runs a petty cash account, ensure you have all the signed receipts with supporting paperwork so the payments can be allocated to the correct headings in the account book. Contact your IFE in good time to make arrangements for handing over the accounts for examination. If you have an IFE from the Federation scheme they will have other accounts to examine and liaising with them (once you know who it will be) will enable them to plan their workload. I hope this will help you in preparing your accounts and if you have any queries about the process please do get in touch. I hope you all had a good Christmas and New Year. As it is now January it is of course time for you to collect the WI subscriptions from your members. For 2019 the subscription for full members is £42. Of this, your WI will keep £20.50, NFWI will receive £11.70 and the Federation will receive £9.80. The annual subscription for dual members will be £20.50 payable to their second WI, who will be able to keep all of this amount. Any new member joining in 2019 after the end of March will pay a pro rata subscription depending on when they join. NFWI define a new member as someone who has not previously been a member of any WI in the past 10 years. I will be including in the January end of month posting, details of the pro rata rates (they are also set out online on My WI) and the forms on which we would like you to make your returns. Also included in the January end of month posting will be the Trustees Report and Accounts for 2018 as part of your WI delegates pack for the Annual Council Meeting in March. I have just spent two days with the auditors who were carrying out the field work for our audit. Just before this I had been asked what the Federation's portion of the subscription covered. The Annual Report sets out the many events and activities provided by the Federation. Our share of the membership fees accounts for about 50% of our total income and meets approximately 90% of the costs of running Ethel Hunt Lodge and paying the salaries of our staff. Without the income from the subscription the Federation would not be able to provide as much as we do for the members or support WIs with their queries. Firstly may I take this opportunity to wish you all a Merry Christmas and Happy New Year. As I am sure you are all aware next month it will be time for payment of the membership subscription. This year the subscription is £42, with the WI part being £20.50. The Federation and NFWI receive £9.80 and £11.70 respectively. This now brings me onto the consequences for claiming Gift Aid. Under the 'Acting as Agent' regime the Federation and NFWI portions cannot be counted as income for the WI and therefore Gift Aid can only be claimed on your portion of the subscription. Federation and NFWI can claim on their respective parts. I know that some of you who currently claim Gift Aid are seriously considering if it continues to be worthwhile to do so, given the resources it takes in relation to the reduced income now received from it. I have been asked for advice/comments by some WIs on whether they should continue to claim and are we as a Federation going to claim Gift Aid? Any decision about continuing to claim is up to your individual WI to determine whether you think it is still worthwhile. As a Federation this is a subject we have discussed at the last two meetings of the Board of Trustees. We have considered the issues, some of which are similar to the views expressed by WIs, especially the staff resources that we have available to deal with making a claim for ourselves. We have come to the conclusion that at this time we will not be claiming Gift Aid but as a Board we have decided to revisit the issue in the future should circumstances change. NFWI have produced a new declaration form which asks the member to sign a declaration for the three parts of the organisation. However, if a member filled in a Gift Aid declaration for their WI before 2018 those remain valid. There is no need to fill in the new declaration form unless that member was gift aiding for all parts of the organisation. Finally, I would be interested, if you have any thoughts as to your members views about gift aiding to the Federation and NFWI. I realise this may not be of help to you who are considering whether to claim but as I said above I think the decision can only be yours as a charity in your own right. Firstly, I would like to start by saying how lovely it was to meet those of you who have become Treasurers, many for the first time. Having been a WI Treasurer myself I always found it very satisfying and I hope you do too. Following on from the Treasurers training days held earlier in the year I thought it would be useful to highlight some of the subjects/useful ideas that came up on the days. Definition of a Trustee. Charity Law defines the person responsible for running a charity as a Trustee, even if the organisation itself uses a different description i.e. committee members. Therefore, even if your WI is an unregistered charity the committee members are Trustees. As the Treasurer do try and be methodical and try to carry out your administration straight away during or after the meeting. Leaving things such as writing our receipts or paying in money until the next month can and often does mean you will get into an awful muddle. For each financial year the numbering of receipts, both general and membership, should start at number one again. Linked to this if you have payments for the Federation for more than one item, e.g. membership and the financial statement one cheque for both will suffice. As you know the Independent Financial Examiner has to be appointed at the AGM. If you are using the Federation scheme there is no need to name the examiner. You just ask for approval for the accounts to be examined by a Federation IFE. This is because the IFEs are allocated to WIs by the coordinator every year and there is no guarantee that you will continue to have the same examiner. However, conversely if your examiner is not part of the Federation scheme then you should name them specifically when gaining approval to appoint them. If you don't already but wish to take part in the Federation IFE scheme then please contact Elizabeth Patterson whose details are in West Kent News. Speakers at meetings - if they have items such as books linked to their talk to sell they may do so, but they should provide 10% of their sales as commission to the WI. When collecting membership subscriptions many Treasurers find it useful to hand out envelopes with the name of the member and the amount required. Finally, I think many of the new Treasurers realised at the training that there was a lot to take in and involved in being a Treasurer. In the words printed on the front cover of a famous intergalactic guide 'Don't Panic'. Take it as it comes, be methodical and it will hopefully all fall into place. I am not in the office every day of the week but I will get back to you as soon as I can. Last month I said I would write about issues arising from the Treasurer's Training days. However, I am postponing that article to write instead about Phishing. I am sure you are all aware that this is where an email is sent to an organisation asking them to transfer money out of their bank account. There have been many instances where charities have been the target. Indeed, recently the Federation itself was an attempted target, with an email sent to me supposedly from our Chair, Annette Smith, asking if I was able to make an immediate bank transfer and to email back so they could send details of who to pay. Whoever sent it also seemed to know who Annette and I were and our respective roles within the Federation. Therefore, I thought it might be timely to highlight a few important points that can protect your WI's funds. Trust your instincts. Many of these emails can sound plausible, but if something appears odd about the request then it probably is. In our case the style was 'off'. Closer inspection then showed that the email address of the sender was not Annette's normal one. If you suspect an email is an attempt to get money don't be afraid to double check with the person it is supposedly from. It is not a question of not trusting the sender. I am sure if it is a genuine request for payment then they will understand. There is nothing so urgent it can't wait while you check. If an email is unexpected or unusual then don't click on links or open attachments. Ensure that you have the appropriate controls on place for all payments, with at least three signatories to the account and dual authorisation for online transactions as well as cheques. This gives the other signatory a chance to query the payment if she is unsure about anything. Do not respond to emails or telephone calls asking for security details. I hope this is helpful and if you have any questions about security and the controls needed for WI accounts please do get in touch. What a busy month! A meeting of the federation Independent Financial Examiners (IFEs) and two Treasurers Training days. It was lovely to meet both the IFEs and Treasurers. As you can probably imagine there were a number of issues that came up at all of the days. Therefore, both this, and next month will be devoted to covering these. As the IFEs had just completed their examination of financial statements a number of points came up connected with completion of the financial statement. Some of them were caused by the new format but others are ones that arise year after year. Money collected as an agent in one financial year but not paid out before year end caused a few problems. If page 3 shows that you have collected money from members for either Federation events or subscriptions but not yet paid it over then this amount needs to be entered in box B1.5 and taken away (not added) from your cash funds. The spreadsheet does not automatically enter interest from deposit accounts. This has to be entered manually. Petty cash still causes problems and has not been accounted for properly. However National now say petty cash should not be used, possibly because many banks are now refusing to deal with cheques made out to cash. 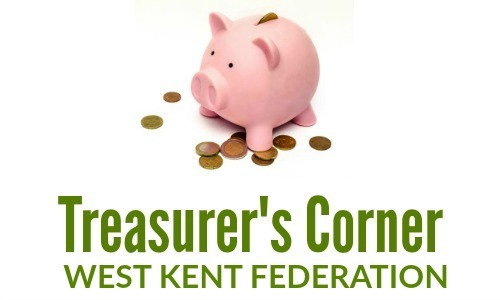 Many Treasurers operate successfully without petty cash, by agreeing with the member to aggregate small expenses and pay on a quarterly basis. Another continuing problem is that cash funds at A5 are not carried forward from the previous year correctly. Indeed, very often no brought forward figure was entered on the front of the financial statement. Some financial statements were not signed by the President & Treasurer. Additionally all pages of the financial statement must be returned to Federation. Page 4 was often missing and as this contains the report by the IFE it is important we have that sheet as well as other pages. Next month - issues, hints and tips from the training days. I have recently had a couple of queries regarding Insurance issues. As the Federation insurance, provided by NFU Mutual, has just been renewed for another year I thought it would be timely to write about the cover it provides to WIs in West Kent. WIs public and product liability insurance - this covers you against claims arising from home-made goods and produce which is sold at your meetings. Money and malicious attack insurance - only covers money held in the Treasurers' home for a couple of days and if money is not paid in as soon as possible after the meeting, your insurance will not cover you should the money be stolen. Your hall's public liability insurance should cover any accidents taking place on their premises, providing all health and safety advice has been followed. Theft of members' personal items at a meeting is a 'grey' area and would depend on the insurance held by the hall. Within the next month or so your WI will be invoiced for your share of the premium. The premium charged is based on the number of members each WI has. Budgets! A subject that has been included in Treasurers Corner before, but I feel it bears repeating. Hopefully, you will have produced a budget for this current financial year, showing your expected income and expenditure till the year end. It's all very well producing a budget but it's of no use if you don't monitor it against what is actually happening and if necessary consider what actions to take if it looks like there are going to be significant differences. You can use the previous year's figures as a starting point for your budget and increase them to take into account any rises in expenditure e.g. an increase in hall rent, cost of speakers. Budgets will also be important for any WI that agrees to the use of their account for the financial aspects of a Group activity. Under the new Group system, the income and expenditure related to such activities must go through an individual WI bank account. As such the WI should agree with the organiser of the event what the costs of the event e.g. coach travel, entry fees etc will be, how many tickets need to be sold and at what price to cover the expenditure. This is exactly what we do at Federation as well as producing an overall Federation budget, each subcommittee produces its own for the events it organises. The budgets are agreed by the Board of Trustees and afterwards the actual expenditure is compared to the budget. All of this seems obvious but there have been situations in the past where WIs have found themselves out of pocket due to not producing a budget. There have been a few enquiries recently about paying speakers from other charities. I therefore thought it was a good opportunity to clarify the rules regarding payments and donations to other charities. In the past, it has always been stressed that as a charity, each WI could not pay another charity which did not share the same aims and objectives as the WI. However in 2016, the guidance changed so that if your speaker brings and invoice from the charity on whose behalf they are speaking, it is permissible for your WI to make the cheque payable to that charity. This is then regarded as payment for services of a speaker from that charity, rather than as a donation, which is not permissible under the Charity Commission and NFWI rules. If a speaker from a charity does not bring an invoice then any payment should be made direct to the speaker. Any collection for a charity should take place after your meeting has closed and money raised in that collection should be given directly to the speaker. It is May again and time for your WIs Annual Meeting to take place. Your Treasurer will present the accounts for the past year and perhaps she will report that you have made a surplus on your income over expenditure. What does your WI plan to do with this surplus, particularly if it is significant? You may pay for an event which must be of interest to and be able to be attended by all your members. Whatever you plan to do must be discussed and agreed upon by all your members before any action is taken. Hello, my name is Gillian Neville and I am honoured to have been voted in as your new Federation Treasurer. I have been a member of Cobham & Luddesdown WI since 2011 and their Treasurer for the last five years. I joined the Board of Trustees in 2016 and have been an Assistant Treasurer to Gill Bowden as well as a member of the Performing Arts, Leisure & Sports sub-committee. Finally, may I take this opportunity to wish Gill all the best for the future and to thank her guidance over the last two years.